With another tight and expensive race in front of him for California's Seventh Congressional District, Dr. Ami Bera (D - Elk Grove) is already facing unexpected strong headwinds as he seeks his third term this November. The surprising development is that the resistance is coming from a group of Democrats including the Mayor of Elk Grove. Also voting against Bera's endorsement was Elk Grove Mayor Gary Davis. 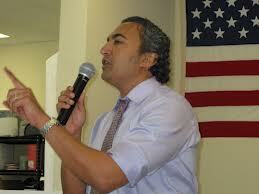 Noting he was born and raised in the Seventh District, Davis said Bera is not doing enough to help district cities. “Born and raised in this congressional district, I know the intricate needs of our communities from Rancho Cordova, where I grew up, to Folsom and Elk Grove," Davis said. "It is critical that our congressional representative be a champion for local communities." Davis, who was one of four Elk Grove delegates to the state convention eligible to vote in yesterday's endorsement, was the only one opposed to Bera. In 2010, Davis briefly entered the Democratic primary against Bera and SMUD Director Bill Slaton but dropped out before the June primary. Last month the Elk Grove-South County Democratic Club failed to endorse Bera at their January monthly meeting. Because Bera failed to receive local endorsements, the matter will be heard when the California Democratic Party convenes in San Jose later this month where it is expected he will be endorsed. Although Bera to date does not have any Democratic opponents in the June primary, Sacramento County Sheriff Scott Jones has entered the race as a Republican. Jones, who defeated now California Assembly Member Jim Cooper (D -Elk Grove) in 2010 for Sheriff and ran unopposed in 2014, is expected to present a strong challenge to Bera. "Dr. Bera will have to be answerable for his record throughout the campaign just as I will. I plan on keeping my message to issues, rather than seizing every opportunity to attack," Jones told Elk Grove News. "I know that may seem unexpected, especially given the last cycle for this district, but it's how I ran my Sheriff's campaign and how I plan on running this campaign. It's a better fit to who I am." For his part Bera, acknowledged the diversity and differing opinion among area Democratic Party members, but feels confident about his prospects at the state convention. "I respect the diverse voices in the party and take their concerns seriously, but I'm confident that I'll get the party's endorsement at the convention later this month." Bera said. "This will always be a competitive seat and I'll continue to do my job and focus on serving the people of my district." If I didn't know better, I just might think The Mayor is angling for a new job. Much as I would like Bera to be primaried, very much, Davis would be a very poor replacement. Beware Davis! •The first vote I objected to was the one he cast to weaken Wall Street regulation. He voted with the Republicans on this one - not with the other CA Dems. After all the work Elizabeth Warren did on Dodd-Frank, and Bera would weaken it. I was darn mad!!! •The other time I called to object was when he voted for Fast Track, a very, very, very bad deal for ordinary people, and the United States, but a great deal for giant multi-national corporations. I was steaming this time, called his office only to have one of his lackeys justify his vote. There was only one other Dem vote like his, if I recall accurately - all others of the 51 (about) House Representatives from CA voted against it. BAD vote, Bera. Once again, he voted hard right with the Republicans. Keep your eye on Bera. I and several of my friends actively supported him during two campaigns. No more. Hopefully, a strong Dem challenger will come forward. A vote for Bera in the future is basically the same as a vote for the GOP. Bera is not to be trusted, despite his 'No Labels' spiel. He is unprincipled as a Dem. A traitor to our values.